A top member of the Boko Haram sect has been arrested in the Ikorodu area of Lagos state on Saturday, December 24, 2016. This was revealed by Tukur Buratai, chief of army staff. who made this revealation during the reopening of two major roads in the state. The roads – Maiduguri-Gubio-Damasak and Maiduguri-Monguno-Baga – were closed during the height of the activities of the insurgents in 2013. He charged his men to arrest fleeing members of the sect. “You must maintain the momentum of the operation. We must pursue the terrorists wherever they are. We must not allow them to regroup,” he said. He said in spite of the takeover of the insurgents’ last stronghold in Sambisa forest, “we have no time to waste”. Buratai described the seven-year fight against the Boko Haram insurgents as “quite sober and touchy”, saying that a number of officers and soldiers had lost their lives in the war. He prayed for the repose of their souls and vowed that the army would recommit itself to the fight until “remnants’’ of the terrorists were cleared. 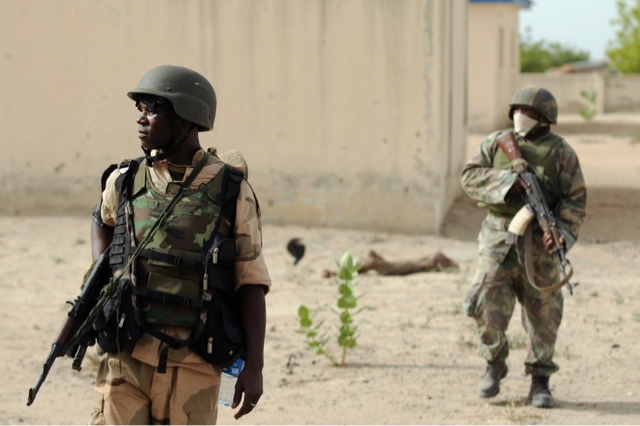 Lucky Irabor, theatre commander, operation Lafiya Dole, had earlier said that the north east had been secured. He also said insurgency had brought untold hardship on the people of Borno and the entire north-east zone.